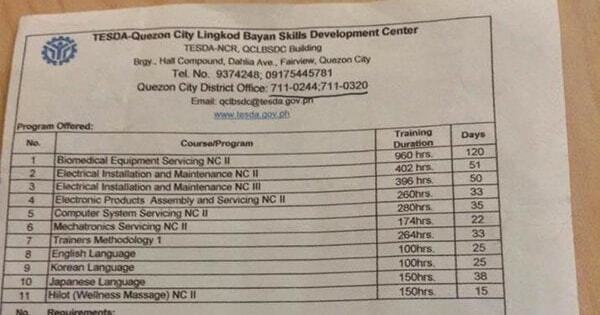 Tesda-Quezon City Lingkod Bayan Skills Development Center (QCLBSDC) posted a Free Tesda courses for QC residents and nearby cities:, I advised you to bring all the list of requirements completely. For you to enroll on your preferred course from the list below. 1. 2 years experience in teaching or 2 years experience in the industry. 2. NC II Certificate (original and photocopy). 3. Transcript of Records and Diploma-College Graduate (original and photocopy). 4. Barangay Clearance (original and photocopy). 5. Certificate of Employment (original and photocopy). 6. Birth Certificate NSO (original and photocopy). 7. 2 pcs each 1 x 1 each and 2 x 2 pictures (white background). Note: Must not be a recipient of any previous Tesda Scholarship.